If you have a game room, at some point you’re probably need to work out as well. 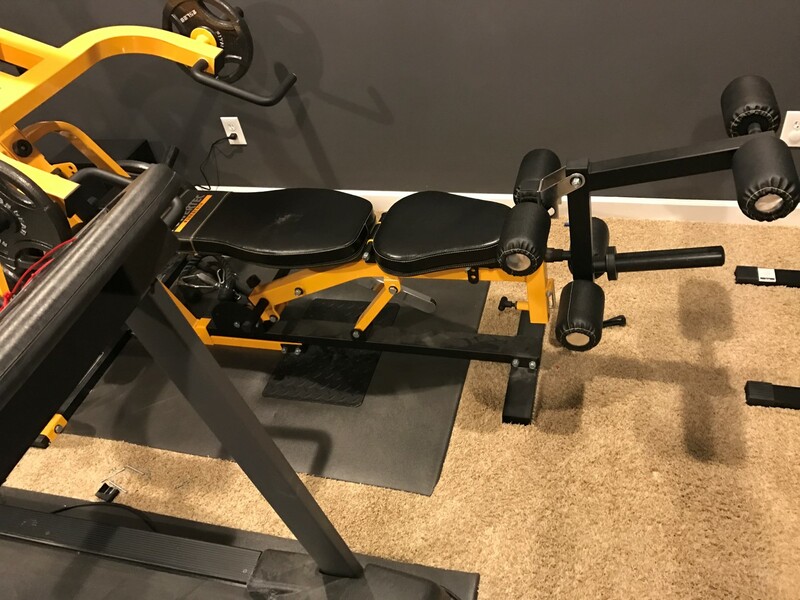 I’ve reserved a small corner in my basement exclusively for an elliptical machine, a treadmill, and a Powertec Workbench weight machine. This review will cover my experience with the machine after using it for the past year. Taking it apart and putting it in my minivan took a while. It’s not hard to assemble or disassemble, but the pieces are heavy and sometimes awkward. I think in total it weighs like 290 pounds, but with additional weight plates and other things I got with the purchase I probably loaded up 600 pounds into my minivan. When I got it home, assembling it wasn’t too bad. I put a rubber mat underneath it to protect the carpet, since it has so much weight I though it would probably mat down the carpet pretty good. It used standard bar weights, so you could add way more weight to it than a standard pulley/plate system. 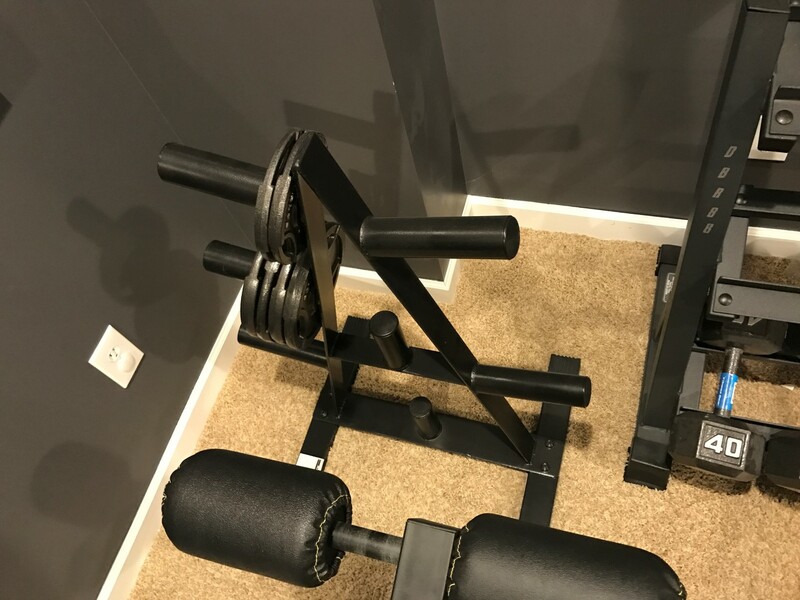 That to me is the biggest drawback of the pulley/plate things that are sold, if you are moderately strong you can never get enough weight for them. It had everything built in for a complete arms and legs workout. Most pulley/plate home options are pretty limited with what you can do. The Powertec had way more options than those. It’s big enough for a big person. Some home machines are made for someone short or super skinny, this machine fit me really well (I’m 6’4″, 180 pounds). Why would I want this over free weights? The biggest thing for me is that I didn’t need a spotter. I don’t have a lifting partner or anything, so being able to lift while having safety in place is priority #1 for me. I’ve tried dumbbells but for me they’re just not great due to my lower back pain that flares up sometimes (dumbbells seem to aggravate my lower back for me, probably because of some kind of form deficiency on my part). One downside of the Powertec Workbench is that it does take a decent amount of space. Basically, you’re going to need at least 6′ by 8′ to fit it into your workout area. I’ve fit it, a treadmill, and an elliptical all into a 12 by 12 room with plenty of room in front of the machines for a rubber mat. 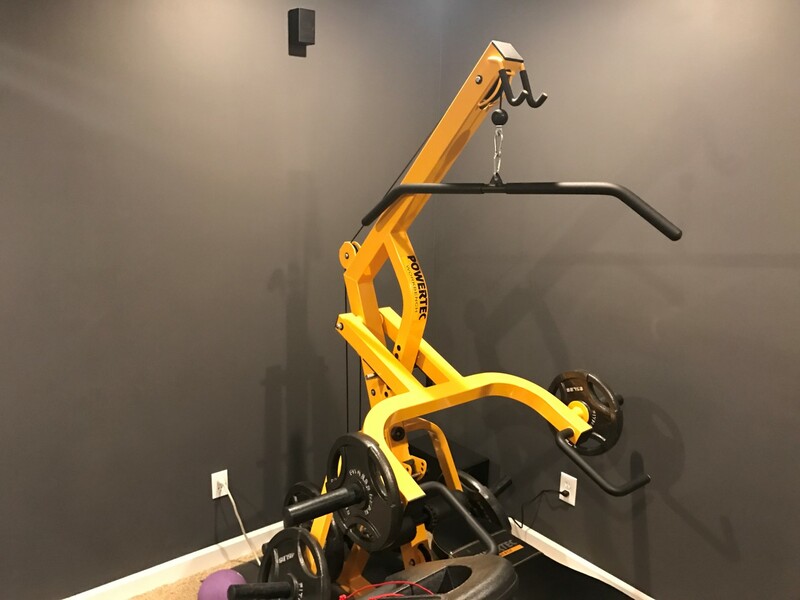 The hardest part in this smaller area is adding and removing weights, it’s definitely more challenging than the pulley/plate system to add and remove weight. I bought enough weights so I could leave them on the posts in between workouts so I didn’t have to move 45 pound plates in between the bench press and lat pull down bar. When doing the pull downs from the upper pulley you have to make sure that you have enough clearance in the rear as the back swings out with the weights on it. The combo of the two has made my area a lot better. 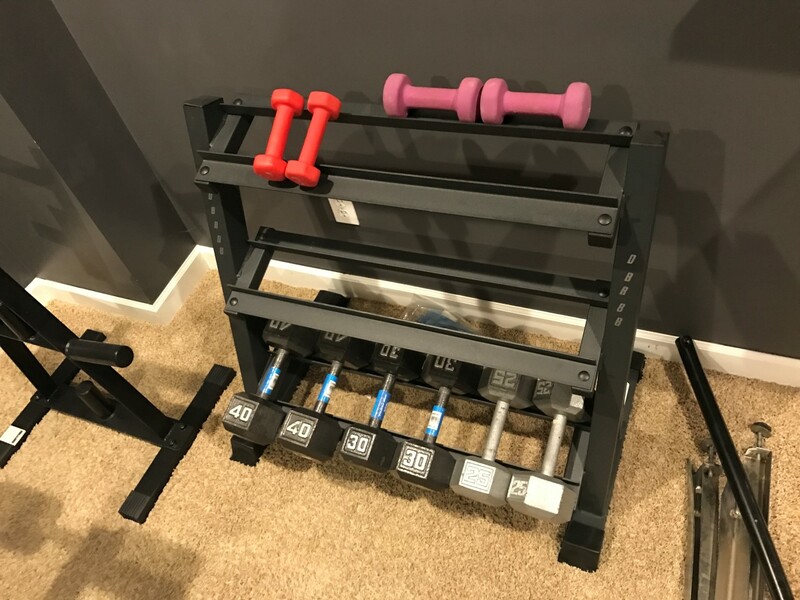 The Powertec Workbench comes with a ton of accessories, way more than most people will actually use unless you’re a really serious weightlifter. Things like ropes, smaller bars, etc will all need to be stored somewhere else unless you’re planning on using them all the time. I’ve actually stored most of my accessories under my pinball machines since they do take a considerable amount of space. Just something to consider when buying this, you’ll need a wall rack or closet space for all the extras probably. 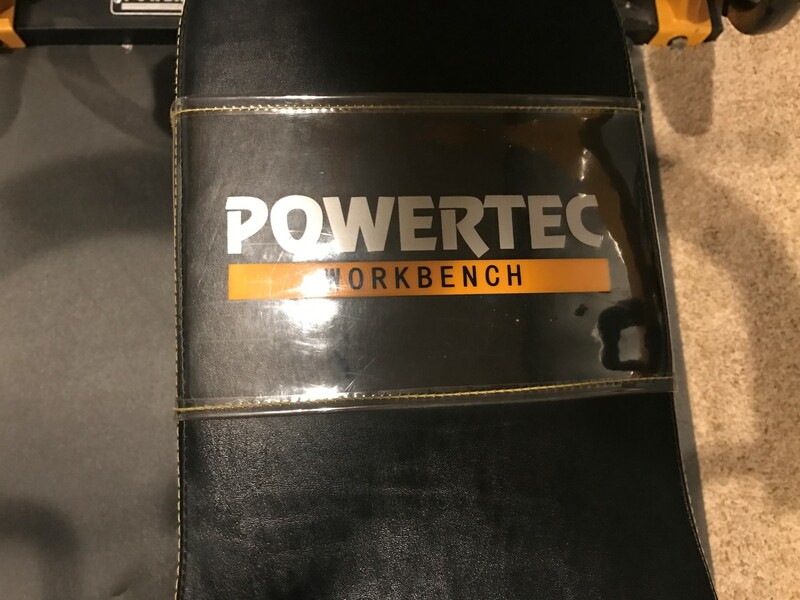 I’ve loved the Powertec Workbench since I bought it a while back. 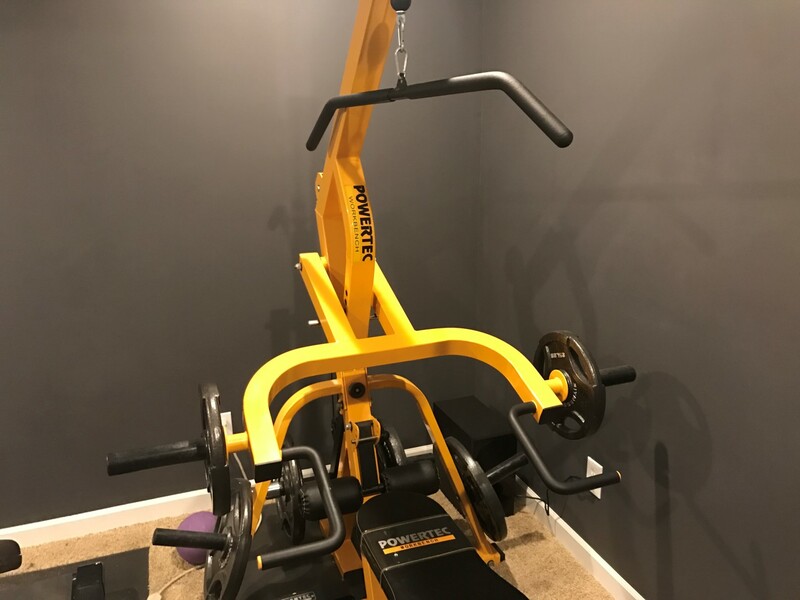 It’s the perfect weight machine for the person that maxes out the smaller pulley/plate machines and who works out by themselves. I like turning on a good show on Netflix or Amazon Prime and then doing my lifting for the day. Hopefully this review has helped you make a decision on this. I bought mine used, but after having used it for a while I’d totally pay full price for the thing new. I haven’t really seen anything else quite like it on the market, I’m not really sure why more places don’t make home machines that can hold a huge amount of weight.